After an enforced absence, Dave and I had our first weekend opportunity to get away and do something fun. 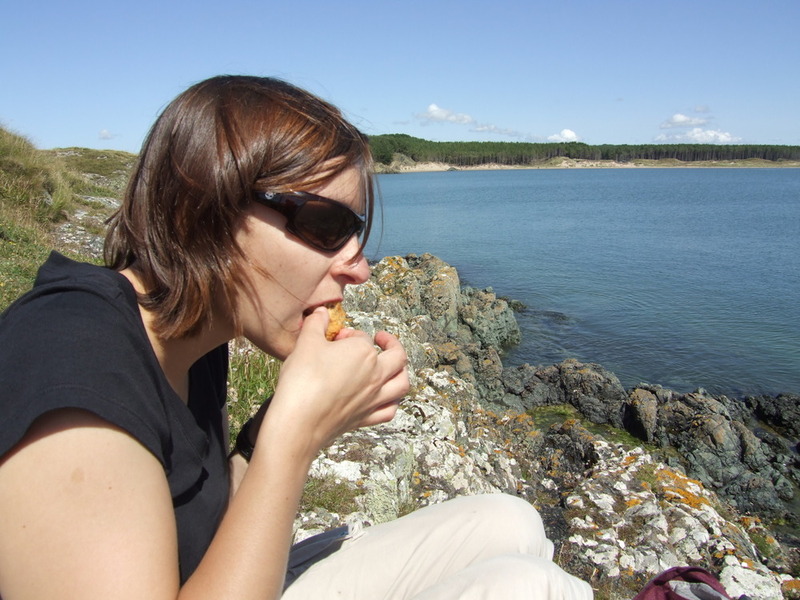 The hamster was safely stowed with family, and we headed off early for Anglesey, off the coast of North Wales. My grandparents used to live on the island, so I'd had many visits, and had seen both the glorious seaside sunny days, and the windy, wet and unrelenting days when the island feels very isolated and exposed. This was Dave's first visit; little did we know that a brief two days could cover both of those eventualities. Tootling out along the A55 (and through the Conway tunnel, which I walked through many moons ago before it opened to traffic), we crossed the Britannia Bridge and onto Anglesey. The traffic had thinned and the few high clouds were scudding over as we plunged off the main road and onto a faintly familiar series of back roads, twisting and turning between a thicket of hedge and stone walls. We shot through the village where my grandparents had lived, and not long after reached our first port of call: Newborough Nature Reserve. 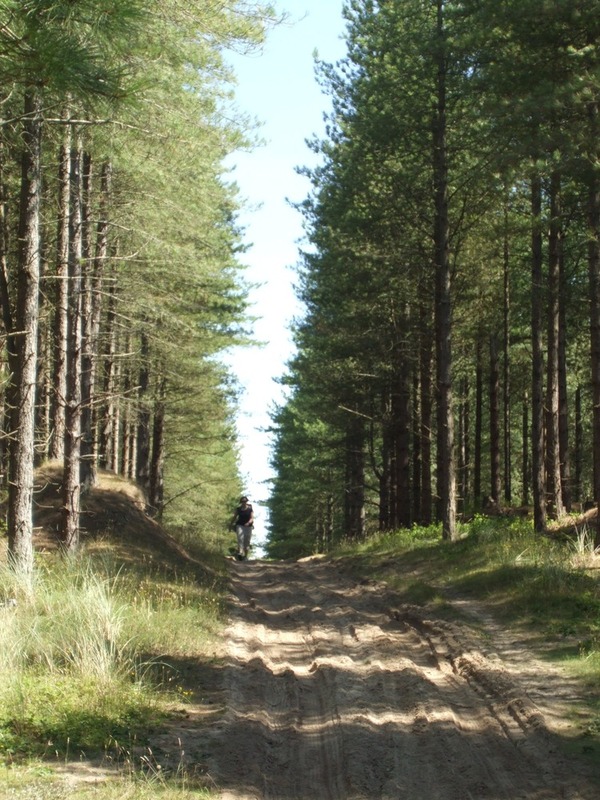 Newborough was once a thriving village, where villagers produced rope and woven materials from the marram grass that stabilises the sand dunes, but the sand blew in, and the area gradually depopulated. 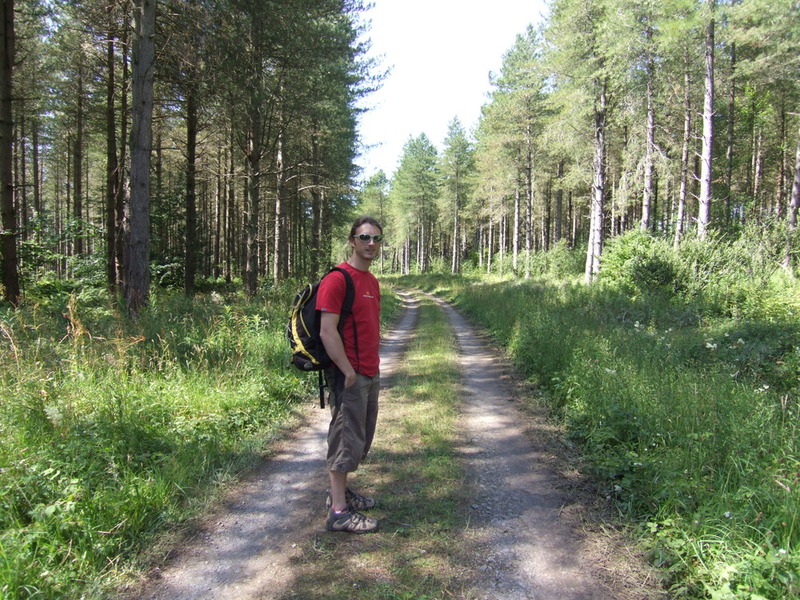 There's now an extensive forest (opinions are divided on whether the forestation of the area is a cause or effect of environmental change in the area) and the ~1500km2 provides excellent walking and cycling; there are a number of marked paths through the forest, and the Anglesey coastal path tracks through the area and around the coast. 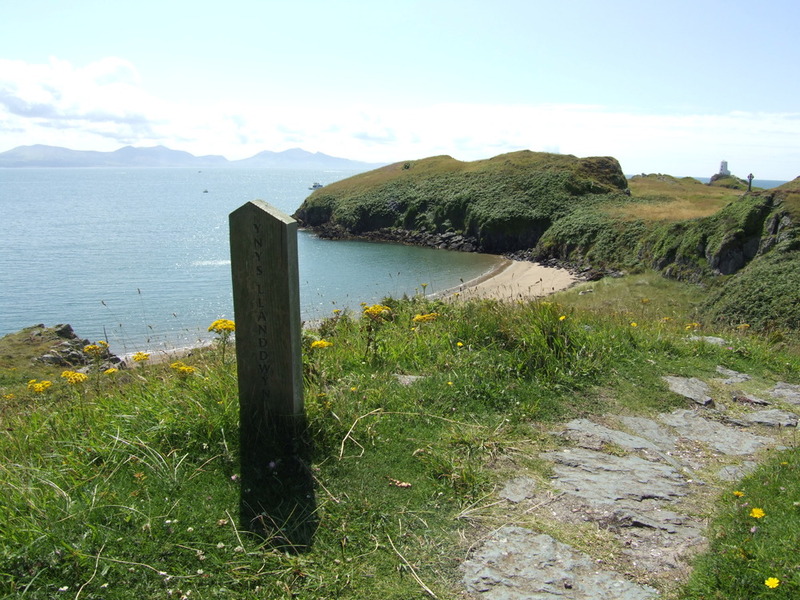 There's also a freshwater lake, mudflats and the tidal island of Llandwyn. Our route through the forest was somewhat circuitous, though aided by an elderly OS map procured from Nottingham library. We remain unsure as to whether the small signs directing us to the "Forest>" or "Beach>" were put there by some kind spirit, or by a more mischievous one, as the route certainly took longer than I expected, particularly based on previous experience. The sun climbed high into the sky and we tramped placidly through the conifers, enjoying the quiet even on a weekend. 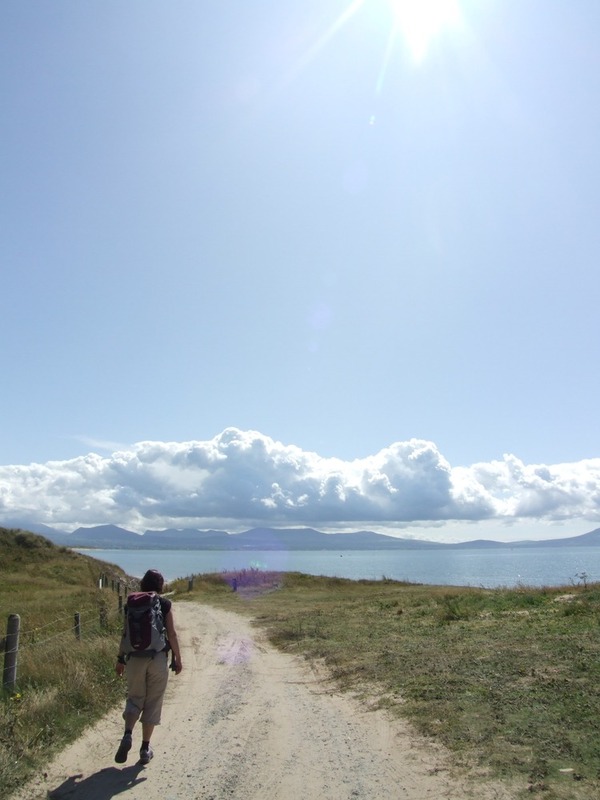 Approaching through the forest also meant that those tantalising glimpses of the sea were to be savoured, whilst simultanously pulling us closely; the path wove left and right, before finally we emerged into dazzling sunlight at the point where the bays of Newborough meet. 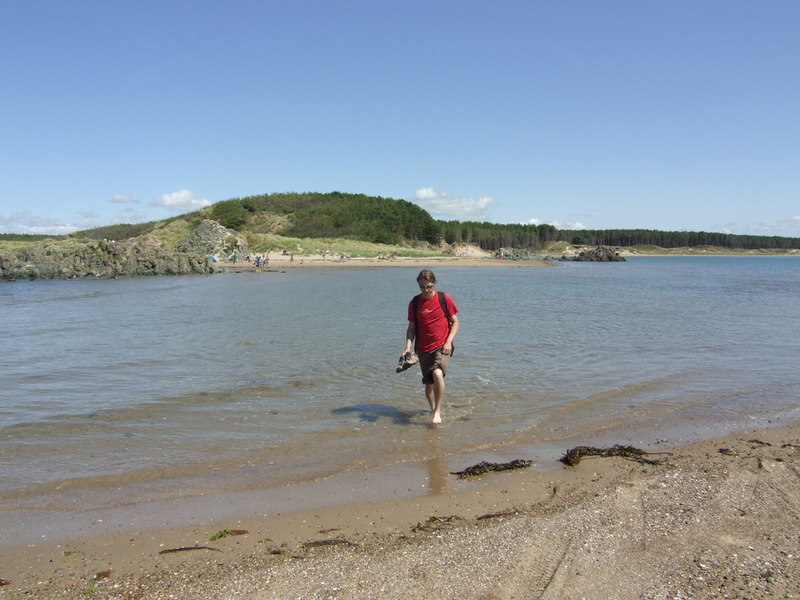 The tide was high and Llandwyn was temporarily an island; others on the beach chose to enjoy the lazy sandy curve and turquoise waters where they were, while we ploughed on, getting our first taste of the chill in the water as we waded across onto the island. Cutting up onto the grassy cliffs which edge Llandwyn, we stopped at an undisturbed bay to enjoy our lunch and a break in the glorious sunshine. 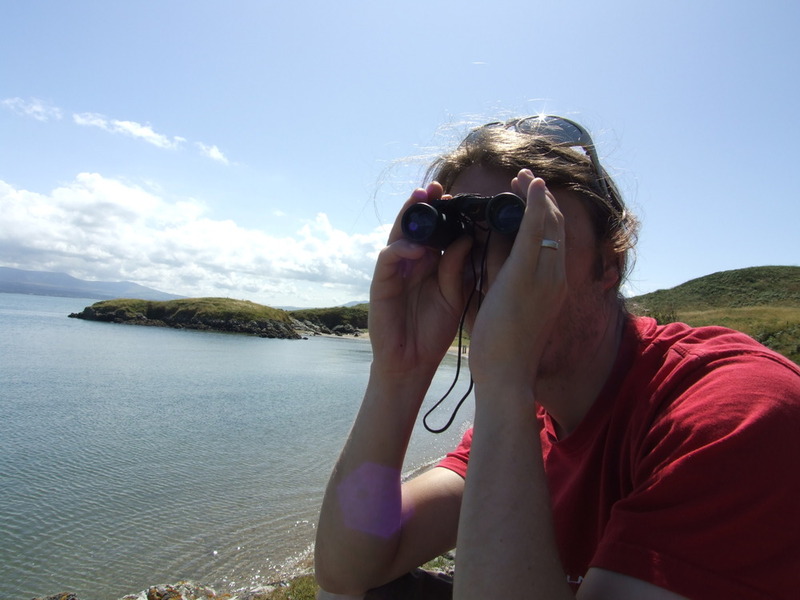 Llandwyn's importance as home to populations of a wide variety of birds meant we restrained the rambling, continuing to circumnavigate the cliffs, arriving finally at the sheltered, sunny Pilot's Cove. The brisk breeze meant a number of boats had moored within the shelter of the bay; we continued up to the old lighthouse, looking out across the water to the hills of Snowdonia, and watching the birds plunging and wheeling around the enthusiastic anglers, perched on rocks above the waves. The tide receded, and the afternoon wore on, and we took some respite on the sandy beach, earning ourselves a toasting in the process. The day was drawing to a close, and we walked back along the shore, cutting up through the forest and amongst the rocky outcrops which dot the Nature Reserve. 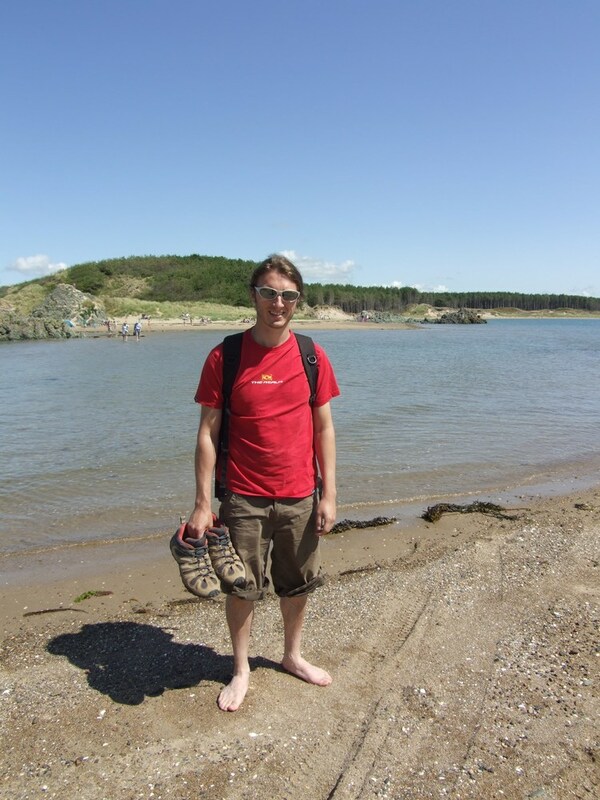 After an undisturbed walk, we arrived back at our starting point, having ticked off a few miles of the Anglesey coastal path, and ready to relax. More of that soon. 1. A quick shot I took on Llandwyn (aka Lovers' Island), looking straight into the sun but showing the almost Caribbean heights that the island can attain in lovely weather! 2. Dave debates who is best with compass and map, as we set out for the seaside. 3. Nicola catches up with Dave, as the sea's now visible from time to time. 4. Only the fewest clouds dared to hang about on this idyllic day. 8. 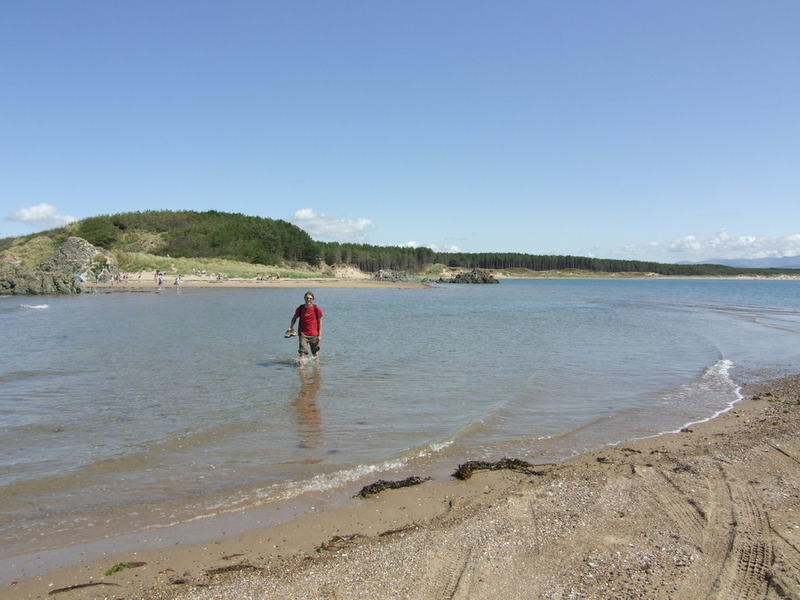 We stopped for lunch soon after our arrival, at a deserted sandy beach. 9. Dave peruses those we left behind on the 'mainland'. 10. 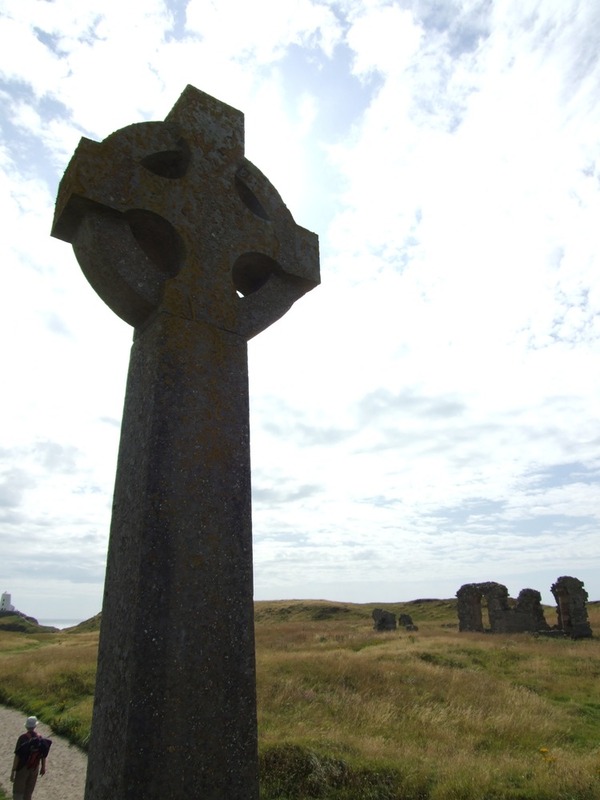 Walking back across the island, you see evidence of its previous religious use, including this more recent addition. Previous post ← The hamster has been exploring without my permission!